Tracey’s husband had requested a muesli bar to take to work, so instead of buying some that are full of additives and preservatives, she made her own. You can switch around some of the seeds or add some nuts if you want, but hubby loved it just like this. Preheat your oven to 180°C and line a slice tin with baking paper. Place coconut oil and honey into your mixing jug and melt 1 min/50ºC/speed 2 (the time will depend on how runny your coconut oil is. It took 1 minute for ours to melt. Just keep setting back to 1 minute until all melted and combined). Now add eggs, vanilla, salt and cinnamon and mix for 5 secs/speed 3. Add sugar, oats and coconut and mix for 3 secs/speed 2/reverse. Add seed mix, chia seeds and flour and mix again 10 secs/speed 3/reverse. Spread out into your lined tin and bake for 30-35 mins, or until golden on top. Allow to cool in tin. It is also easier to slice. 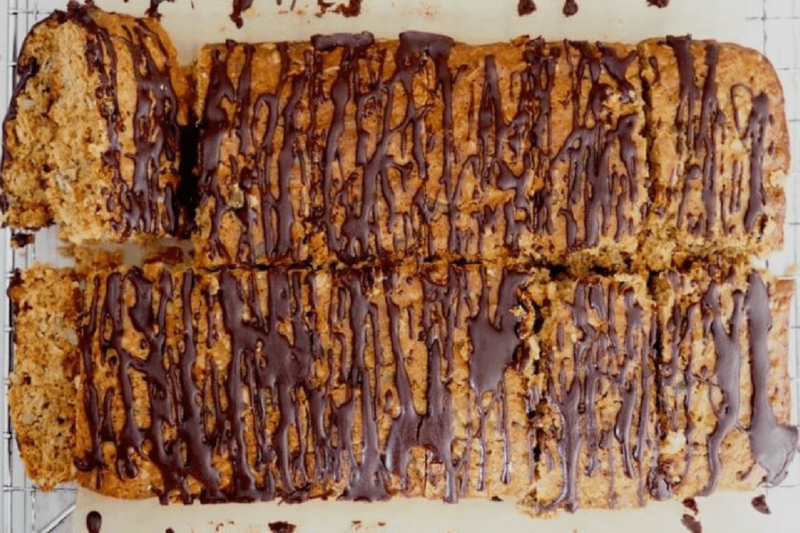 You can drizzle with chocolate if you wish. Store for up to one week in an airtight container. We cut ours into pieces and froze them - then take a piece out each morning to pack for lunch. Place coconut oil and honey into a small pot and stir over a low/medium heat until well combined. In a large mixing bowl add all other ingredients and stir until well combined. Pour in the coconut and honey and mix well. Allow to cool in tin. It is also easier to slice in the tin. This was delicious. I was looking for a more authentic muesli bar for my sons lunch box, this is more cake like, but so delicious, I took it to work all week!